This is a very nice looking seasonal waterfall. 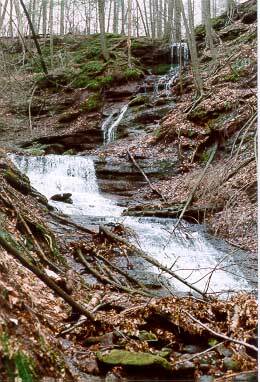 A brook goes down a series of falls at the same place where a smaller brook flows over the side of the gorge. The easiest way to view the falls is from the trail on the rim of the gorge. The pictures from the bottom were obtained by wading through the very cold brook and up into the gorge. * I do not know or am unsure of the offical name of these falls.